Some of my courses are designed for job seekers (Designing a Killer Job Search Strategy, Informational Interviews, a course on your LinkedIn Profile and another course on a proactive strategy for LinkedIn, etc. ), some are designed to help you be a better communicator (Becoming a Better Listener, Presenting to the Bosses, Working and Communicating with Different Personalities, Effective Phone Skills, Effective Email Communication, etc. ), some are designed to help you in your career (Career Management 2.0, Building and Managing Your Career Plan, etc. )… you get the point. 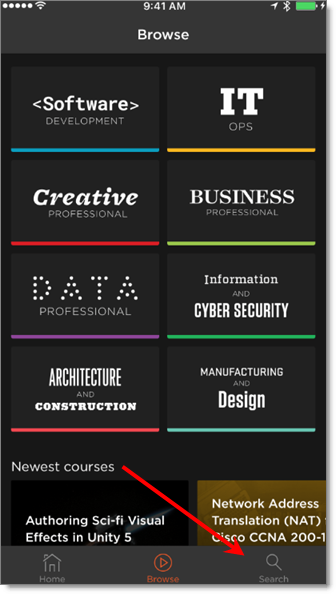 See all of my courses here. Disclaimer: as a “Pluralsight author” I get compensated for every minute… indeed, for every second that anyone watches any of my courses. Whether you are a paying member or use the 30 day pass and don’t spend a dime (you don’t even give them your credit card on the 30 day pass! ), if you watch my course, I get compensated. 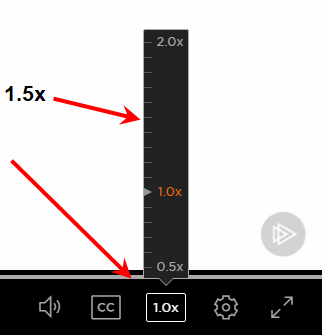 To change the video speed, start to play a video, then in the lower-right area of the video player click on this button, to see the speed options. Only do it as fast as you are comfortable… but if you can do more than 1x, you’ll finish a course faster, and be able to watch more courses! When you are on your mobile device, you can choose courses to watch while you are offline. This will download the course and allow you to play it from anywhere (think: while 30,000 feet in the air, while your phone is on airplane mode!). This means you can learn while you work out, while you are on the subway, while you are on vacation in the mountains (I know, I know)… anywhere. Once you get back online, the app communicates to the Pluralsight server and shows that you have watched the course. Remember, you still need to go into the Pluralsight Tracker on JibberJobber if you want to report having watched the course and get JibberJobber premium upgrades. Here are the instructions to get and use the Pluralsight mobile app (you probably don’t really need instructions, but here they are). I put a lot of work into each course. I had fun doing the visuals, and spent hours agonizing over how things looked. I also realized that my courses did not require visuals to learn about the topics… the visuals were a nice complement but not necessary. I’m not saying don’t pay attention to the visuals, but if you want to just listen to my courses, as you work around the house, or drive to work, go for it! Think of my courses as something of a podcast, or audio booklet. If you feel like you are missing out on a certain visual, you can always switch back over to your mobile or PC and watch them. Remember, after you watch any Jason Alba course on Pluralsight, go to Tracker in JibberJobber and report them to get free JibberJobber upgrades! There’s no limit on this.